BonesPro 4.5 introduces paint brushes for efficient skin weight painting. 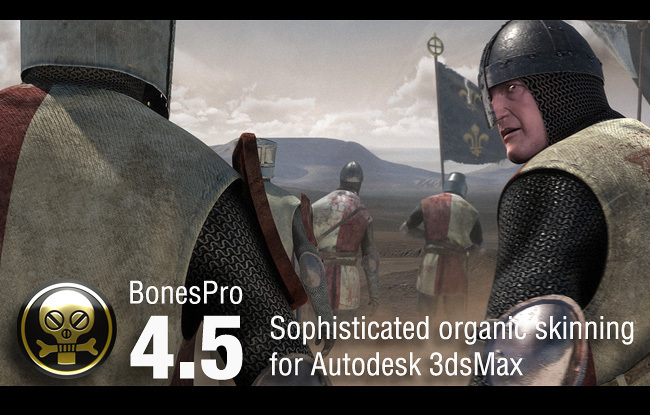 In addition to standard brush functions 3ds Max users are familiar with, BonesPro 4.5 brings Skin Smooth Brush, which smooths the skin, creating perfect folds, blending and equal surfaces with just using few mouse moves. Many core functions were improved in their calculation speed, making BonesPro faster than ever before. To make working with BonesPro more intuitive for artists the default 3ds Max undo system is now supported in addition to the original undo options from earlier versions. BonesPro 4.5 features a completely overhauled MAXScript interface, making the integration into a company production pipeline and the automated control of the skinning process easier to implement than before. Backwards compatibility for the old interface is included for already existing scripts. Completely new MAXScript interface for easier and more extensive third party access. 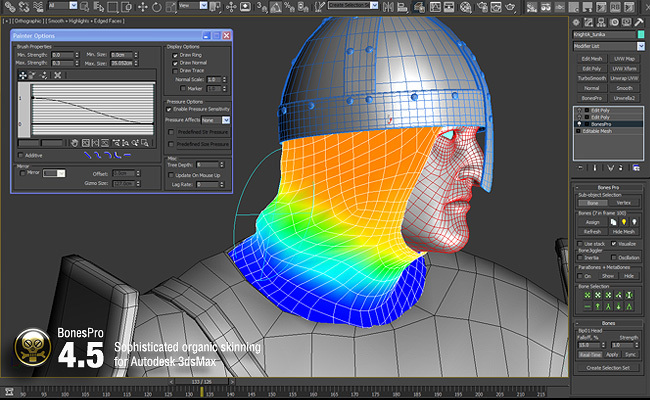 3ds Max default conform undo system added to the existing legacy workflow. MetaBones now have an optional real-time mode similar to ParaBones. Significant performance increases for the most often used actions in BonesPro. BonesPro now works natively with object types and no longer converts them internally. This improves performance with large modifier stacks and interoperability with other modifiers. Bone groups can now easily be turned into selection sets through a new option in the Bones rollout. Bones with non-orthogonal local coordinate systems can now be used like normal bones without causing distortions. If you are a veteran user of BonesPro you can now take the next step and improve your animation workflow even more. If BonesPro is new to you, check out the tutorials and free trial to see how BonesPro can increase your productivity. 3d-io games & video production GmbH is specialized company for high-end software development, modeling, animation, rendering, CG effects and 3D industrial design. 3d-io GmbH, headquartered in Wiesbaden, Germany, has an established strong presence in game development, design & video production, digital content creation as well as in graphics and animation. We are dedicated to provide easy-to-use software products accompanied by dedicated support team, experienced programmers and top notch 3D artists. Digimation specializes in developing and delivering 3D solutions for the training and simulation industry including; Interactive Maintenance Trainers, Small Arms Trainers, Virtual Task Trainers, as well as Virtual Environments used in homeland security applications. The company’s service division produces photorealistic 3D parts used in maintenance trainers, OpenFlight 3D models used in simulations, and full 3D animation.